The New York State Rifle & Pistol Association calls yesterday’s gun control rally inside the Legislative Office Building a total farce. Unable to demonstrate any sort of public support for their proposals, antigun legislators and New Yorkers Against Gun Violence, held a dog-and-pony show in the Well of the state legislative office building for a handful of people who were bused in from New York City. Addressing scores of vacant seats in an almost empty hall, legislators lined up to speak to the couple of dozen or so people who had skipped school in order to be there, and reiterated their support for the same, failed gun control policies they have been promoting for years to an increasingly skeptical public. 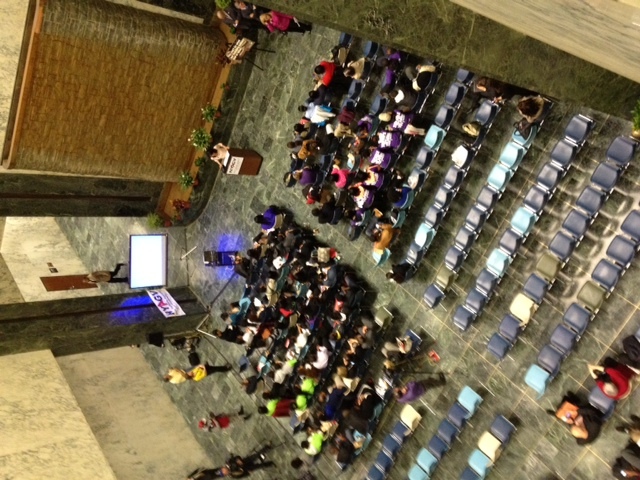 By contrast, the rally sponsored by NYSRPA on March 20 attracted several thousand attendees from all across the state. Those concerned citizens gave up time from their families and their jobs to travel to Albany at their own expense to demonstrate their support for their civil rights. Last month a couple thousand people from all over the state came to Albany to lobby for gun rights. Today New Yorkers Against Gun Violence had their lobby day. As you can tell by this shot looking down into the Well, they managed to get a couple dozen people to show up and those had to be bused in from the City. To the surprise of no-one, Mitt Romney won all of the delegates in yesterday’s primary. With Newt Gingrich hinting that he will drop out of the race soon, talk has shifted to who might be Romney’s running mate. VSSA notices that Governor Bob McDonnell appears to be trying to raise his profile. NRA rated him an A when he ran for Governor back in ’09. Why? Bloomberg is the last person Romney needs to associate with. He’s a uber antigun, nanny-state, control freak. This isn’t much but probably as good as we’d get out a candidate. He’s way better than Ray Kelly whose name is being floated by some Republicans. New York holds its Republican presidential primary tomorrow. Given that Mitt Romney pretty much has the GOP nomination wrapped up it isn’t expected to generate much attention. That did not stop Rudy Giuliani from inserting himself into the race by endorsing Romney today. The antis need to take this failure personally because this shows a strong personal dislike of the issue by members of Congress. There are lots of reps. in safe districts who could get away with signing their pledge and not have to worry about any ramifications at election time. That they could not get even one of them to do so really shows how toxic the antigunners have become. Legislative Report #19 is now online.